The Stack-On IWC-55 Full-Length In-Wall Cabinet is manufactured by the Stack-On company based out of Wauconda, IL. Since being founded 1972 the Stack-On Products Company is the leading manufacturer of storage solutions and firearm security products, and offers a broad range of security solutions. 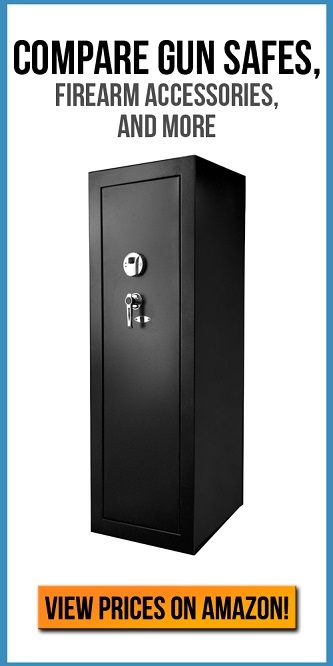 With a safe or cabinet for any budget or security need. This particular cabinet, the IWC-55 has undergone stringent testing by a certified California Department of Justice laboratory. And in the end, it has been rated as an approved Firearm Safety Container. This model features a unique keyed pick resistant lock of exceptional quality. Which is a great deterrent to any attempts at unauthorized access to your valuables. The lock is slightly recessed into the cabinet door, leaving its low profile in tact. Its flush mount design allows the cabinet to be concealed behind large mirrors or pictures, behind furniture, in the back of a closet or even in the floor. With a three point locking system that secures the door at the top, bottom and opening side of the door. The pry-resistant placement ensures that you are guaranteed the peace of mind you are looking for. While the locking bolts meet the minimum ½ inch requirement for firearm safety containers put in place by the California Department of Justice. With a weight of 32 lbs, it is designed to fit into any standard wall between two 16 inch on center wall studs. Installation will be quick and simple to do yourself with the included hardware, pre drilled holes and instruction guide. With these dimensions the Stack-On IWC-55 is perfect for storing two rifles with optics or shotguns up to 52 inches tall. It also includes a removable tray for ammunition or hand guns. Additionally the unit has three removable steel shelves that can be used when not storing larger guns for items such as your jewelry, medication, important documents, or anything you want to keep secure. The Stack-On IWC-55 Full-Length In-Wall Cabinet has plenty of options for customization and organization to fit all of your needs. All three storage shelves and the removable tray have foam padding. As well as the bottom of the cabinet to ensure your valuables will not be scratched or damaged. This product takes up no additional space in your home, as it is meant to sit in between two studs that were built with your home. Being very easy to install, conceal makes it a great value. It is a simple, effective and inexpensive way to ensure your valuables and firearms do not end up in the wrong hands. Not only is it secure, but it also boasts considerable storage space and enough organization to meet all of your needs. After thoroughly testing the Stack-On IWC-55, we at TossTheKey can confidently say we would strongly recommend purchasing this safe.